After seven years of renting houses, Lisa Jackson and her son Reece were more than ready for a home of their own. Each 12-month lease had ended on the day after Reece’s birthday. ‘Every time he had a party we were packed and ready to move,’ Lisa recalls. That all changed six years ago, when Lisa found a semi-detached house within her price range in a quiet residential area she had long admired. Be inspired by how Lisa Jackson transformed this post-war semi in to characterful home using recycled utilitarian and vintage finds. Then browse more real home transformations and check our expert guide on renovating a house, too, for more guidance. What did appeal was the generous amount of space – three bedrooms, a kitchen and living room, and gardens to the front and rear – and the freedom to make her mark on a home at last. She wasted no time; within a week every wall had been stripped, light fittings discarded, carpet lifted and floorboard sanded. She would like to have gone further, but her vintage homeware business was taking off, and for the first two years she had little spare time to give to decoration. The upside was she was in the perfect position to gather the fabulous collection of vintage finds that make each room so striking. The first significant step was to fit oak floorboards, salvaged from a school gym and still showing every scuff and paint streak of their past. ‘I got the joiner to lay it in the kitchen initially,’ she says. ‘It was a labour of love – it isn’t as if it comes ready to be laid; some boards had to be discarded because they were warped or split, and they’re all different lengths and sizes. ‘The idea was that I was going to get them stripped afterwards but I love it the way it is. Everyone says: “When are you going to have your floors done? It will be fantastic!” and I have to say: “Actually, I’m leaving them as they are”. It would just look like anybody else’s floor if I had it stripped, and all that history – the marks, scrapes and colours – would be lost. The biggest challenge for Lisa, with the help of her fiancé Ian, was to plan a layout that used her favourite antique finds – a housemaid’s cupboard, haberdashery counter and army bench – and yet still had room for all the kitchen essentials. ‘We sat for nights trying to work this kitchen out,’ she says. ‘I had lots of ideas, while Ian sat and drew it all out, to the point where we both had a headache. It was driving us mad. ‘We’ve done the best we can with the space we have and managed to fit everything we need into the recess. If we hadn’t brought it out so far – if it had been normal bench depth – we couldn’t have managed it, but by bringing it out flush with the wall we managed to find room for the sink, oven and hob.’ Lisa’s taste is eclectic, but she is particularly drawn to worn and weathered industrial pieces. A long, narrow work table bridges the gap between kitchen and living area, the cage doors of a factory lift slide across her bookshelves, walls are punctuated by factory clocks and gas station lights. Lisa found the oak-framed Commer tipper truck advertising poster in an antique shop. The walls are painted in Farrow & Ball’s Ball Green and the bedlinen is from Debenhams. It isn’t easy to balance sometimes brutal styling with home comforts, but Lisa has been careful to soften the look with restful, earth-toned colours, warm woods, butter-soft leather and bleached linen. ‘I love earthy colours, and green in particular,’ she points out. ‘It’s not intentional; I keep finding myself painting another room green but it’s a colour that works with all of this wood and metal. 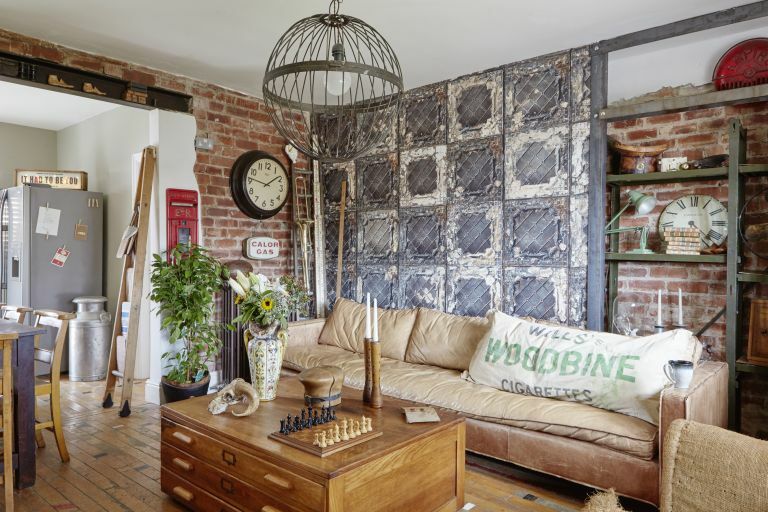 ‘I love vintage industrial, but I also want it to be homely.